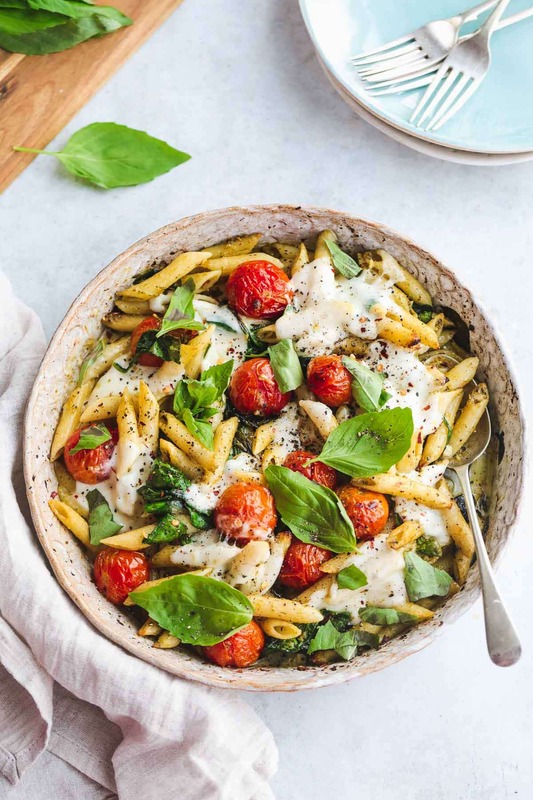 Caprese pasta bake is an easy dump-and-bake summer recipe that the whole family will love! Ready in under 20 minutes, this recipe is so easy to throw together and perfect for a quick dinner, a picnic or for your packed lunch! This fresh and easy pasta recipe is a family favorite! It comes together really easily, and you’ll want to keep making it over and over again. 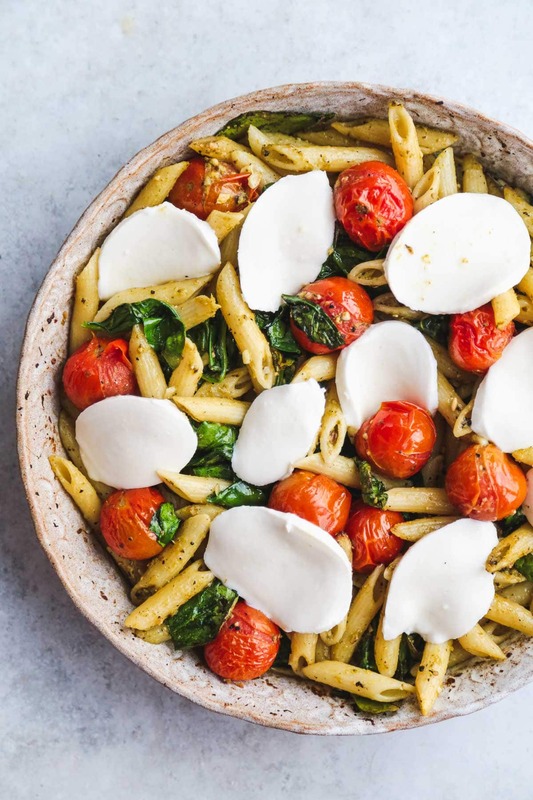 I’m a big fan of Caprese salad, and this pasta is only better. 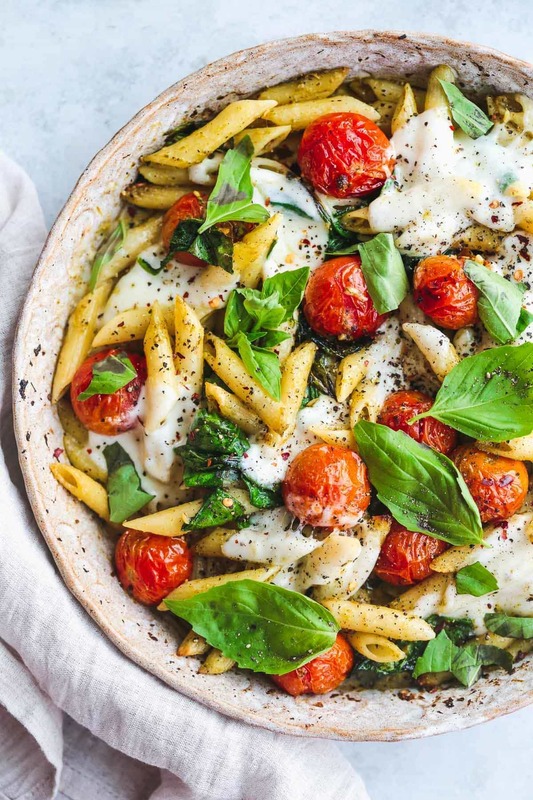 Pasta is tossed with roasted tomatoes, garlic, olive oil, and spinach and then baked to perfection with melted mozzarella cheese. Try this recipe once, and I’m sure that you will fall in love with it! Caprese salad is a simple Italian salad made with mozzarella cheese, fresh tomatoes and basil leaves. Often it’s drizzled with olive oil and seasoned with salt and cracked black pepper. 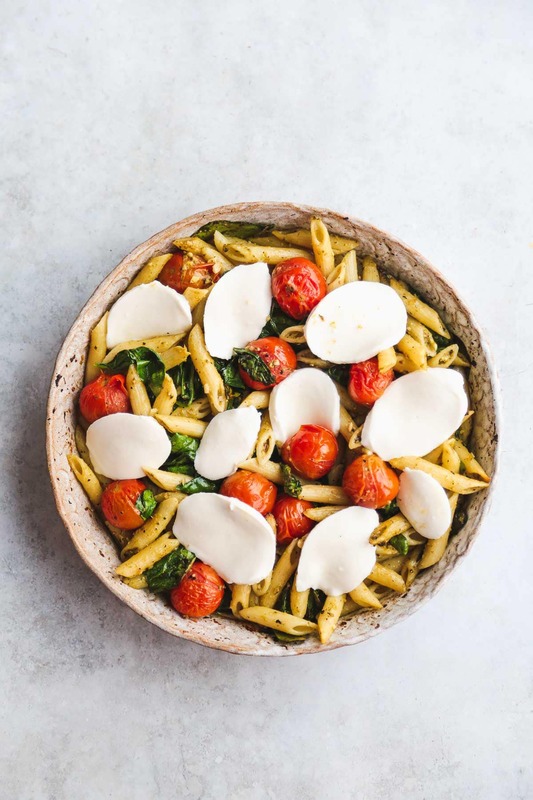 As I love Caprese salad so much, I thought that it would be a good idea to toss in some pasta and turn it into a filling main dish rather than just a salad. Start by roasting the cherry tomatoes in a deep baking dish. Toss the tomatoes with a drizzle of extra virgin olive oil, minced or crushed garlic, ground black pepper, and salt. Meanwhile, cook the pasta according to the package instructions. Use short pasta. When the cherry tomatoes start to pop or collapse, take the baking dish out of the oven. 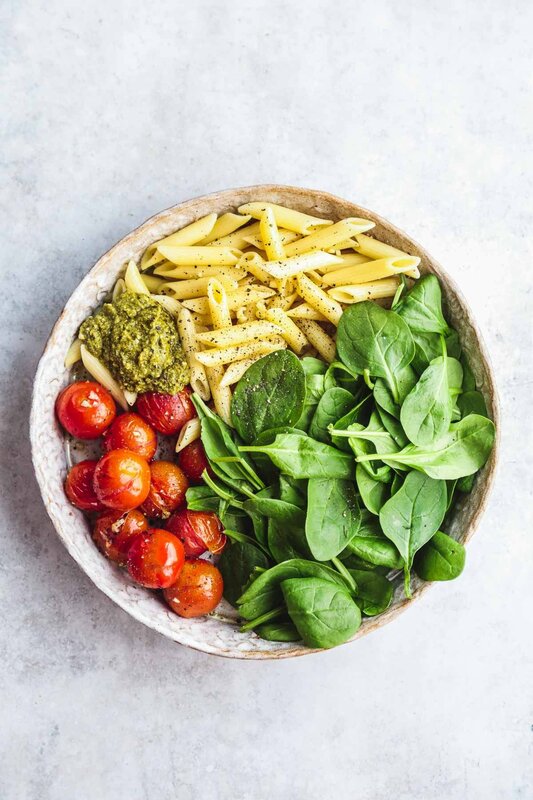 Drain the pasta, and add it to the baking dish along with baby spinach leaves and basil pesto (either homemade or store bought). 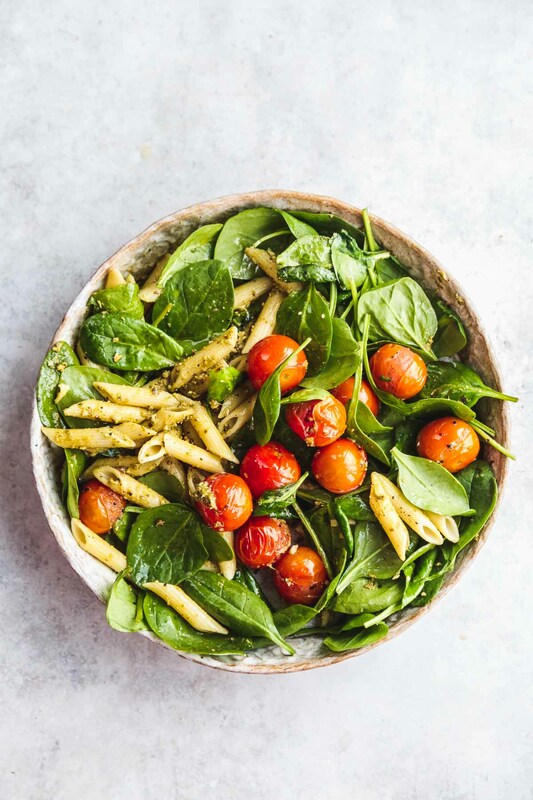 Gently toss the pasta with the spinach, pesto, and roasted cherry tomatoes until combined. Put back in the oven and bake for 3 minutes. Now it’s time to add the mozzarella cheese. Arrange pieces or slices of the mozzarella on the top of the baking dish and bake for 3 minutes until just melted (the cheese will start bubbling). Make sure that you stay close to the oven, as the mozzarella can easily burn and become tough. Take the dish out of the oven, season with ground black pepper, chili flakes and salt if needed. And serve! 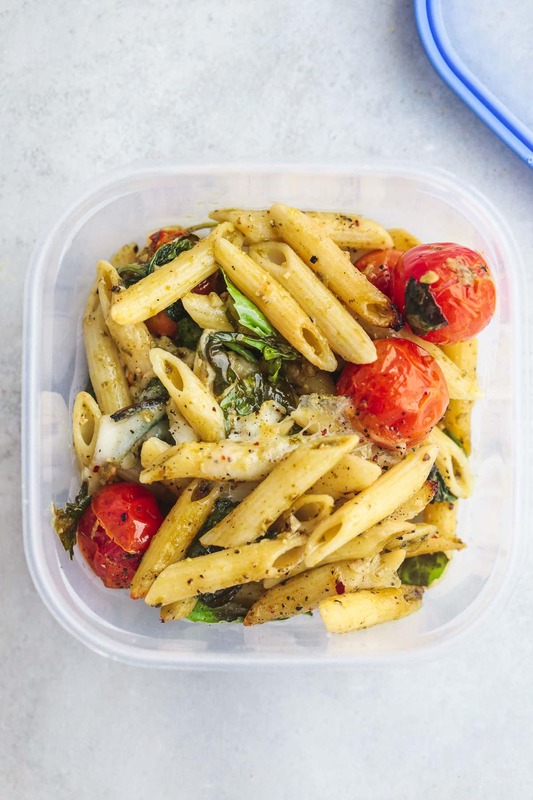 This pasta is great for a packed lunch to take to work, school or even a picnic. It’s reheated easily and quickly, and can also be enjoyed cold. You might want to reduce the amount of garlic if you like, however since the garlic is cooked it’s not very sharp in taste. 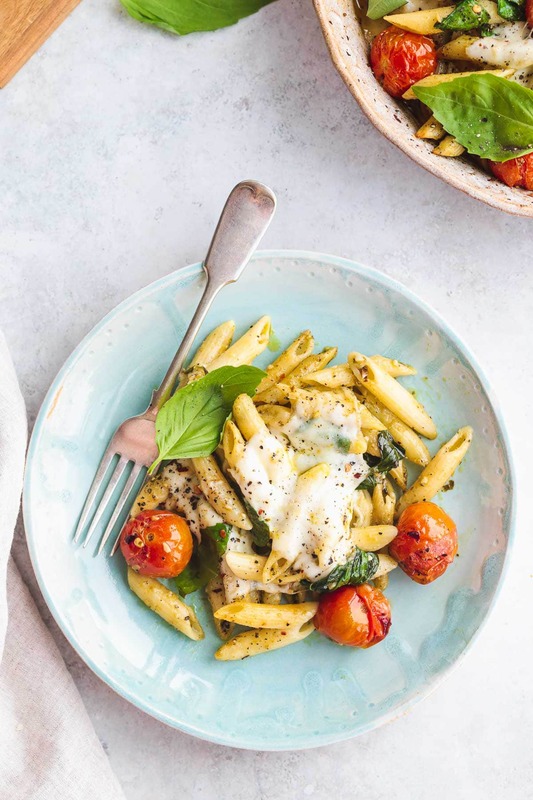 One portion of this pasta contains as little as 226 calories*, and it’s a great and fresh summer dish that kids and adult will love. Weight watchers points: 7 WW points. Preheat oven to 200c (375f). Cook the pasta according to package directions. 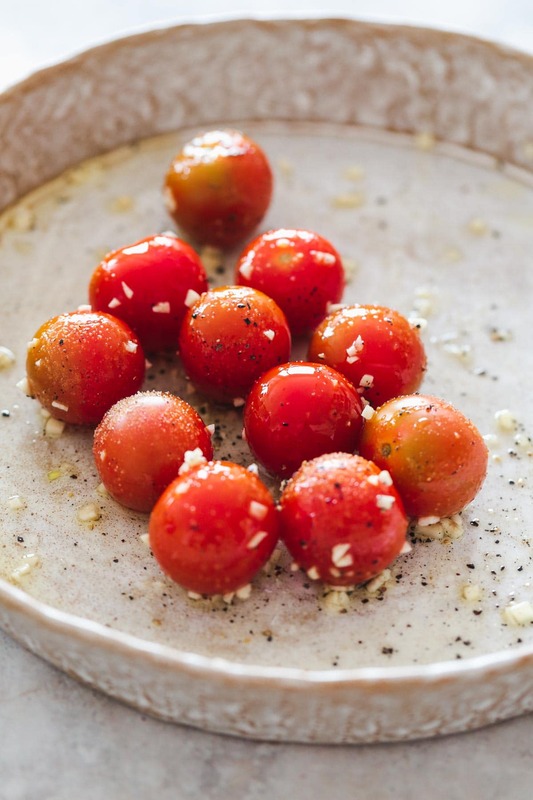 In a deep baking dish, add the cherry tomatoes, minced garlic drizzle with olive oil and season with salt and pepper. Roast for 7-8 minutes or until the tomatoes start to pop (collapse). Drain the pasta, and add it to the baking dish along with the baby spinach leaves and pesto. Toss to combine and bake for 3 more minutes. Arrange the torn mozzarella cheese on top, and bake for 3 more minutes or until the cheese is just melted. Remove from oven, season with more cracked black pepper and chili flakes, fresh basil leaves and serve. *Nutritional information are rough estimates. A quick and fabulous dish! This couldn’t look more delicious!! I’m always a fan of anything pasta related, and I love the simplicity of this recipe! That mozzarella melted on top just makes this even more mouth watering! I am adding this to my dinner line up for the week! Love how easy this is for busy evenings! This looks amazing! I can’t wait for my family to try this.